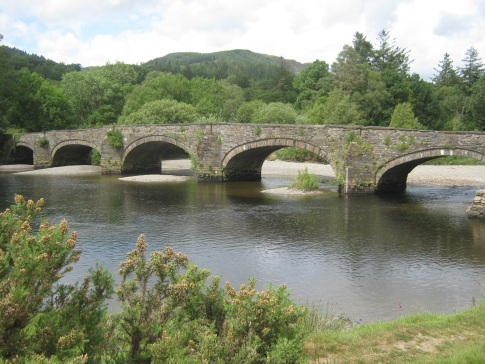 The stone bridge over the Mawddach River at Llanelltyd, near Dolgellau, in the awesome Snowdonia region of North Wales. The present bridge dates to the second quarter of the 18th-Century. There is documentary evidence of an earlier bridge in the late 17th-Century. Also, histories relating to the nearby ruins of Cymer Abbey mention a bridge in the area as early as 1400 AD. I've been meaning to post up some pictures from our recent vacation in Snowdonia. Here's a few to be going on with. 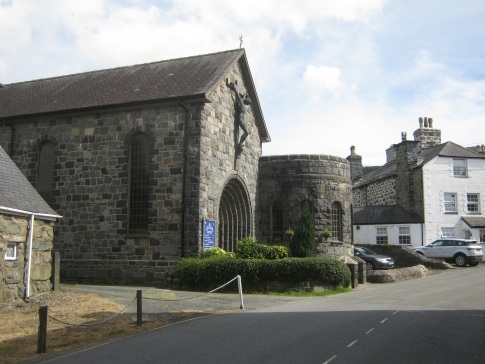 During our stay, we found the Catholic parish church of Our Lady of Seven Sorrows in the town of Dolgellau. There is a small Carmelite convent, just outside the town, which is also served from there. The west front of the church, featuring its large Italian, sculpted crucifix and impressive Romanesque doorway. Interestingly, this doorway is thought to have been inspired by the one at the famous Cormac's chapel, on the Rock of Cashel near the south-west coast of Ireland; an incredible monastic ruin, which we recently pictured here. 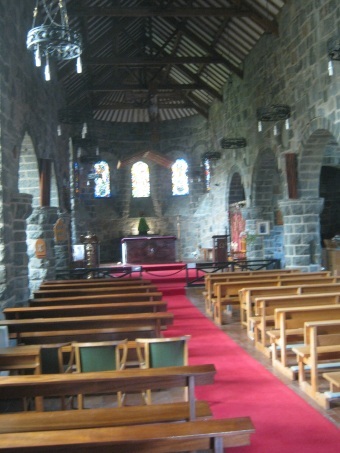 The church is constructed in the Romanesque style from local rock-faced grey stone topped with a locally sourced slate roof. With its aisles, arches, rounded pillars, lunette windows and apsidal chapels, one could be forgiven for thinking that the fine church was built long ago. However, it is refreshing to learn that its construction only began in 1963; with the consecration of the church taking place as late as 1970. I describe that as refreshing, because this noble little church managed to buck that awful trend, which was at that time sweeping throughout the Western world, of constructing ugly-looking modernistic church buildings; which were themselves so cut off from authentically Catholic architectural and liturgical tradition. 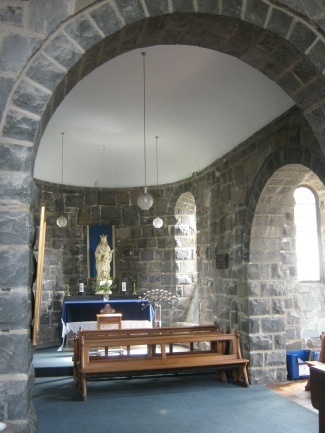 Having entered the Dolgellau church at the west door, one can turn to the right and view the well-lit Lady chapel, with its beautiful statue of Our Lady, Help of Christians. Notice, here the splendid cut-stone forming the Romanesque archways. At right-angles to the Lady Chapel, and seen jutting out as an apse-ended chapel to the right of the front-door in the street picture above, is the Baptistry. In a neat bit of artistic theological expression, the Baptistry actually has seven windows, to represent the Seven Gifts of the Holy Ghost. It is great to see the Baptistry still in use at the back of the church like this. This continues the ancient Catholic tradition of welcoming catechumens symbolically at the back of the church; drawing them into the Faith through the waters of Baptism; and then leading them into the main church for the Holy Sacrifice of the Mass and other sacraments. Such liturgical movement and meaning is too often lost in modern times, when some priests and architects insist on repositioning baptismal fonts even on the sanctuary; thus confusing and obscuring the meaningful historical practice. Moving forward from these rear chapels into the main church was quite a numinous experience on the days of our visits, because the parish priest had beautiful Gregorian chant playing in the background. We found that the church, with its traditional architecture, altar-rails, raised sanctuary and centrally located Tabernacle and stone altar, was a very peaceful place to remain in silent prayer before Our Blessed Lord in the Blessed Sacrament. It is nice to see an apsidal sanctuary like that these days. There was also a traditional looking crucifix over the sanctuary, a hanging baldachino, hanging bronze crown of thorns and Italian screens with gates set at the sides of the sanctuary; these latter made from brass. There is another chapel at the sanctuary end of the church, which is dedicated to the Most Precious Blood of Our Lord Jesus Christ. Apparently, whilst the rugged stone of the building is locally sourced Welsh material, the stone in the altars is from the Holy Land. 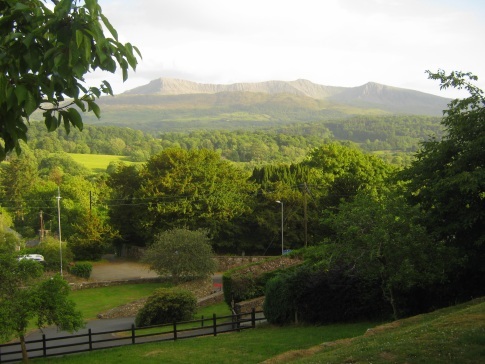 The story of the parish at Dolgellau is remarkable in itself. There had been no Catholic parish priest in the area since the Protestant revolt in the 16th Century. In 1928, a young priest arrived from Malta to help locals and visitors to receive the sacraments. His name was Fr. Francis Scalpell (1895-1970). The first Masses were offered in a local stable, which was later extended into a fish and chip shop, with the help of some Italian prisoners of war. Over the decades, Fr. Scalpell is thought to have written over 25,000 letters, in order to raise funds for the growing community of local Catholics to have a small church built in the town. 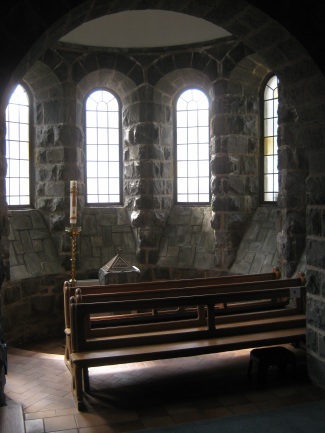 In the early 1960's an anonymous donor gave sufficient funds for construction to begin, with the proviso that the new church be built to harmonise with the local mountainous environment. It is quite moving to think that Fr. Scalpell died in 1970, the year of the church's consecration. It is as though he could rest once the job was done. One of the days that we visited to pray would have been my late Dad's birthday. 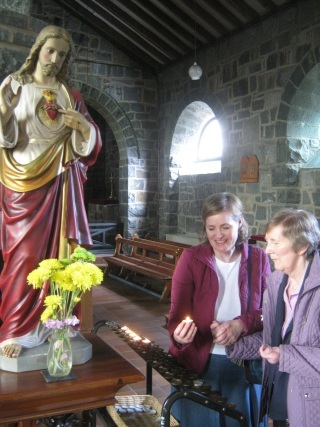 Being also the month of the Sacred Heart, and as Mum used to always light candles for her family members before suffering her stroke, we went over to light a candle for Dad before the fine Sacred Heart statue in the church. We had a nice little thing happen on the way in which, although obviously subjective and the kind of thing that many would scoff at, I'm taking it as a little sign of God's Providential care. We had been delayed by traffic on the main bridge into the town and this meant that we were a little later than planned. However, it also meant that, as we drove towards the church, a car pulled in front of us with a private registration featuring the letters ''KEN''. God rest him, that was my dad's name. Private registrations are reasonably rare to begin with, and I've never seen one with those letters before, so I'll chalk that one up to Providence. Especially as we were going there specifically to pray for his soul on his birthday date. Funnily enough, a few days later it was Father's Day here in the UK and we were by then back on Merseyside. We were driving into the cemetery where Dad is buried to put fresh flowers on Dad's grave, and to say some prayers for him, when another vehicle came towards us with yet another private registration bearing the legend, ''KEN''. So, I took that as another little sign of God's loving care! I always was a country boy at heart! Psalm 94:2: The Lord will not cast off His people. For in His hands are all the ends of the earth, and He beholds the heights of the mountains.